Quickly integrate your WordPress forms with ActiveCampaign’s powerful suite of marketing tools. With Caldera Forms’ ActiveCampaign add-on you’ll quickly be able to integrate your WordPress forms with ActiveCampaign’s powerful suite of marketing tools, thus making your website a well-oiled marketing powerhouse. Once you connect to your ActiveCampaign account in Caldera Forms, you’ll be able to add subscribers to your lists, tag them, and more. Caldera Forms is already a favorite and trusted forms plugin for WordPress. The ActiveCampaign add-on is built with ease-of-use and stability first. If you’re already a Caldera Forms user, setting up and using ActiveCampaign add-on will be a snap! You can convert your existing forms in just a few clicks. Simply authenticate to your ActiveCampaign account! No coding required, folks! 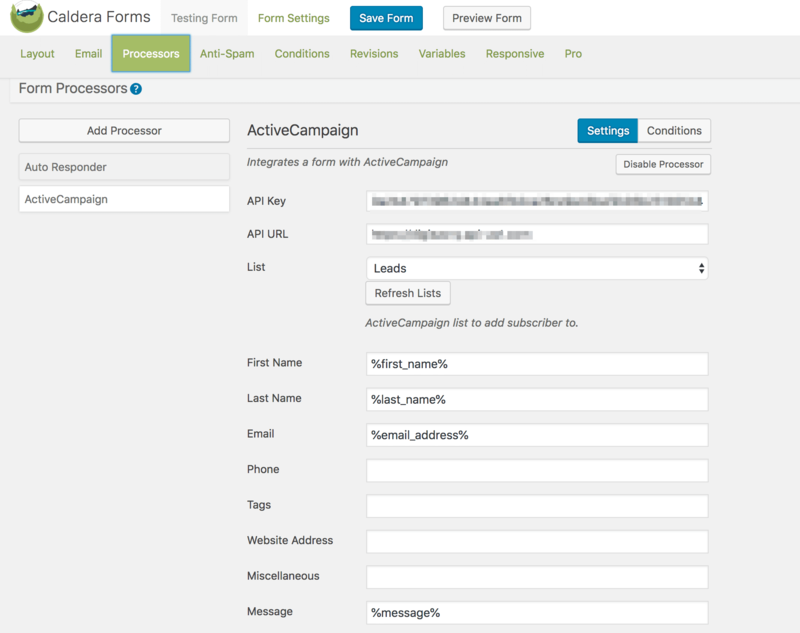 With the Caldera Forms ActiveCampaign add-on, make sense of your subscriber’s critical information in ActiveCampaign by mapping your form fields to your ActiveCampaign contact fields. Custom Contact Fields in ActiveCampaign are supported, too! The ability to gather any type of data you want and send it to ActiveCampaign not only makes this integration flexible but it helps you collect more meaningful data that can improve your marketing efforts! Want to know what types of customers subscribe most on your website? By simply adding fields for people to fill out in Caldera Forms, you can send it to ActiveCampaign and create meaningful reports and take informed actions that help produce more sales and more interaction. By leveraging Caldera Forms’s conditional fields logic you can easily ensure your forms are compliant and adhere to European Union’s new GDPR regulations. The Caldera Forms ActiveCampaign add-on also allows you to ensure the collection email addresses easily and safely and help you grow your audience. Depending on your organization’s needs, you may want to try the double opt-in process, which includes an extra confirmation step that verifies each email address. Read The Getting Started Guide: Learn To Use Caldera Forms Aweber.